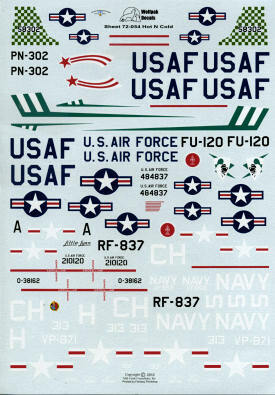 More nice subjects from Wolfpak Decals covering six subjects from the 50s and 60s so everyone should find something they like. First up is an RF-51D (F-6D) as attached to the 45th TRS at Kimpo in 1952. Not a whole lot of color on these with only a red fin tip to break up all that silver. Next, a scheme that your editor used on a 1/48 kit. This is an 86 FIS F-86D as flown out of Youngstown Municipal Airport in 1955. Despite the rather large sum spent on placing interceptor units around the country, few of these lasted more than a couple of years. From VF-653 aboard the USS Valley Forge in 1951/52 is this F4U-4. Red tips to the fin and drop tank as well as the prop spinner. A T-28B of the Royal Laotian Air Force in 1965/66 is next. It is in overall ADC Grey (FS 36473). I had always thought these were T-28Ds but I guess not. 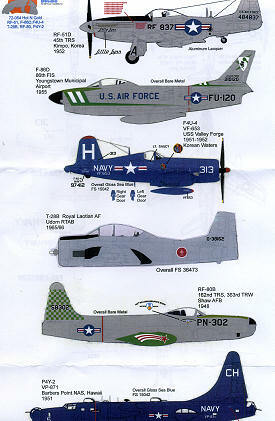 The fifth option is an RF-80B assigned to the 162 TRS/363 TRW at Shaw AFB during 1948. This one has the outer tip tanks in green to match the tail checks. Finally, a PB4Y-2 from VP-871 at Barbers Point during 1951. This is overall gloss sea blue.